U.S. soccer star Megan Rapinoe is shown kneeling during the national anthem Sunday, Sept. 4, 2016. 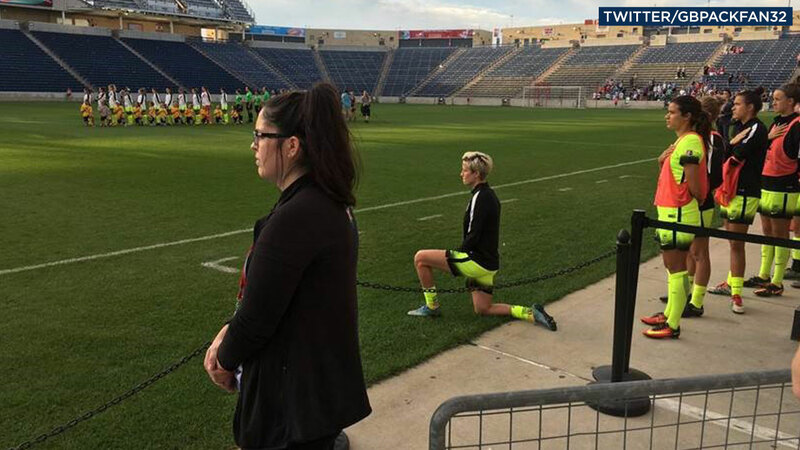 CHICAGO, IL -- U.S. soccer star Megan Rapinoe knelt during the national anthem Sunday night before the Seattle Reign's game against the Chicago Red Stars "in a little nod" to NFL quarterback Colin Kaepernick. Kaepernick's refusal to stand for the anthem to protest racial injustice and minority oppression came to public notice when he remained seated on the bench before a preseason game against Green Bay. On Thursday night in San Diego, he and safety Eric Reid kneeled during the anthem before a game against the Chargers. "It was very intentional," Rapinoe told American Soccer Now after Seattle's 2-2 tie in the National Women's Soccer League game. "It was a little nod to Kaepernick and everything that he's standing for right now. I think it's actually pretty disgusting the way he was treated and the way that a lot of the media has covered it and made it about something that it absolutely isn't. We need to have a more thoughtful, two-sided conversation about racial issues in this country. The 31-year-old Rapinoe helped the U.S. win the World Cup last year and played in the Rio Olympics. "It's the least I can do. Keep the conversation going," Rapinoe tweeted.